After prayer and seeking GOD for solutions, when you have earnestly made your petitions known, mixed them with faith, then you need to enter into rest, as you wait on GOD for the manifestation of the answer. This is the time that you trust when you cannot see, cannot hear, cannot know. Be still and KNOW that I Am GOD! God, who has numbered the hairs on your head, who knows the way you take, who gives you every heartbeat, every breath you take, knows the number of cells in your body, records every prayer, every thought that you have of Him, every time you have spoken of Him, will take care of you. His promises are yes and so be it (yea and amen) to those who believe. Though we DO BELIEVE, for believers believe, we don’t always enter into that rest that remains for the people of GOD. It is not an assumption, but a sure trust that GOD HAS HEARD. GOD understands. GOD KNOWS. GOD cares, and GOD will answer your prayers and give you the desires of your heart as you wait patiently on HIM. If we could do it, we would have already done so. If others could have done it for you, they would have done it already. So we LOOK ONTO JESUS, alone, who is the Author and finisher, completer of our faith. Have faith in GOD, not what you can do, already did or what others did or can do or you hope they will do. TRUST in the can do, has done, and will do GOD who is your FATHER! He cares more about you than you do yourself. Fretting is not the manifestation of faith that you need that pleases GOD. Truly when you completely trust in the FATHER, you can sleep in the midst of the storm. You are safe in His promise, His presence and His performance alone. GOD will not deny you any good thing, and we also need to trust that HIS WILL IS ALWAYS the best, not just better. In the last hurricane that hit our state, I slept deeply and peacefully through the worst of it, and awoke in the morning after the storm had passed us by. The magnitude of the storm was uncharted in the history of recorded hurricanes, and it was coming directly at us! I had prayed that it would veer to the right and go out to sea, but it went to the left over land. When the power went out, before we had a direct hit, I prayed a simple prayer. “Lord, you said you would quiet my fears, and I am tired. I just want to go to sleep. I was out like a light in moments, and slept through the fierce winds and rain, never waking up for a second. When I walked outside, just before the sun was up, I could see NO DAMAGE to the house, no downed trees, and tall oak trees surrounded the property. There were only tiny branches down, and none of our properties or church was touched by the storm. Two houses down from my house, a huge tree nearly demolished their house. I SLEPT THROUGH THE STORM, entering into the rest that remained for Me, though the circumstances were threatening and frightening. Though it was a physical storm, most are not. You will go through more storms in life than you want to think about. But the rest remains for you in each challenge, each threat, each potential destruction. Trusting in GOD when you cannot do ANYTHING, is the rest you will have while you wait on Him. Wait with confidence and unwavering faith in the GOD that cares for YOU! He never sleeps, so that you can! He is never weary. 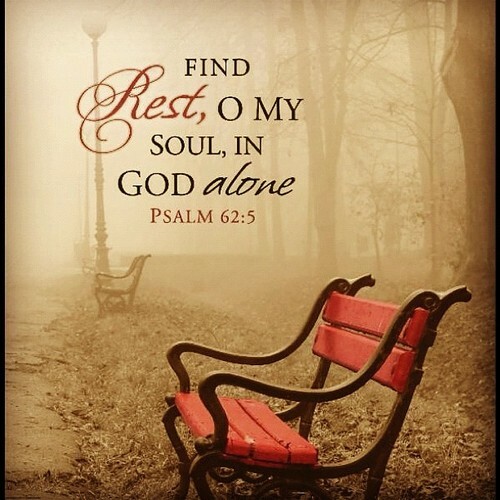 As you rest in Him, praise Him for the answer. For your hope is in Him who is on your side, on task, never too late, and will give you everything you need. May you enter into this peace and rest that is for you, because you have prayed, and NOW BELIEVE, as you wait on GOD to give you the complete manifestation of the answers you need. Can’t sign up for newsletters on the website, wanted to apply for a personal prophecy but it said they were suspended until after thw new year and it is way after the new year. Hallelujah! Thank you merciful and faithful Father! THANK YOU MY FAITHFUL FATHER GOD, AMEN AND AMEN!